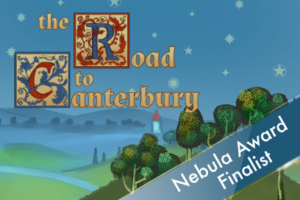 We’re proud to announce that The Road to Canterbury, the latest in our popular “Choice of Games” line of multiple-choice interactive-fiction games, is now available for Steam, iOS, and Android. It’s 25% off until May 3rd! May the best story win! Enter the medieval world of Chaucer’s Canterbury Tales, where your journey, and the stories you tell, will change history. The Road to Canterbury is a 175,000-word interactive medieval adventure novel by Kate Heartfield, where your choices control the story. It’s entirely text-based—without graphics or sound effects—and fueled by the vast, unstoppable power of your imagination. London, 1375. The Black Prince of England is dying, and peace with France hangs in the balance. You are a young pauper on a secret mission. Join a pilgrimage to Canterbury with the powerful noblewoman Philippa de Roet, co-sister-in-law to the Black Prince, and Philippa’s husband, Geoffrey Chaucer himself, the customs agent, spy, and occasional poet. Your mission is to persuade Philippa to change the course of history. You’ll fight raiders and knights, aid or foil an assassin, fire up a peasants’ revolt, and change your luck for the better or worse. And of course, there’s a storytelling contest with a big prize—one you intend to win. The Hundred Years’ war is heating up: will you stoke the flames on the Road to Canterbury? We hope you enjoy playing The Road to Canterbury. We encourage you to tell your friends about it, and recommend the game on StumbleUpon, Facebook, Twitter, and other sites. Don’t forget: our initial download rate determines our ranking on the App Store. The more times you download in the first week, the better our games will rank.